We have a nursery. It is adorable. Two days to go until Bean's due date. As you know, I wanted to design a gender neutral nursery....this is a one time deal, and will likely be the nursery for future babies. I wanted the nursery to be quiet, soft, serene and comfy for Mommy and Daddy. I also wanted texture and pattern to play a role...there are some interesting elements to the room, fun things for the baby to look at. The 13' wide horizontal stripes were a given. I was working with newly painted walls and the base colour was not going to change. 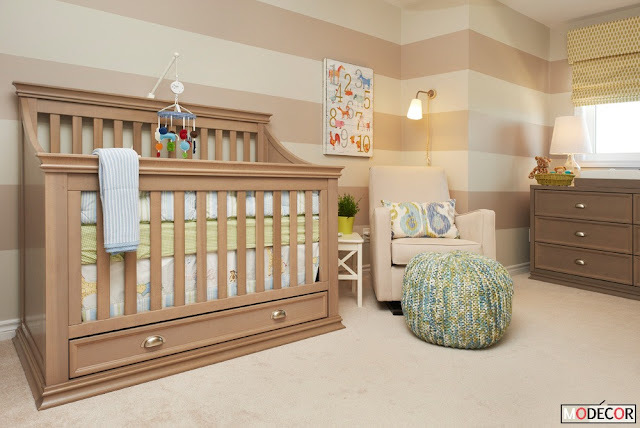 The crib and dresser/change table from Fab Baby Gear, became the colour inspiration for the stripes. More on that process here on STRIPES AND DIAMONDS post. 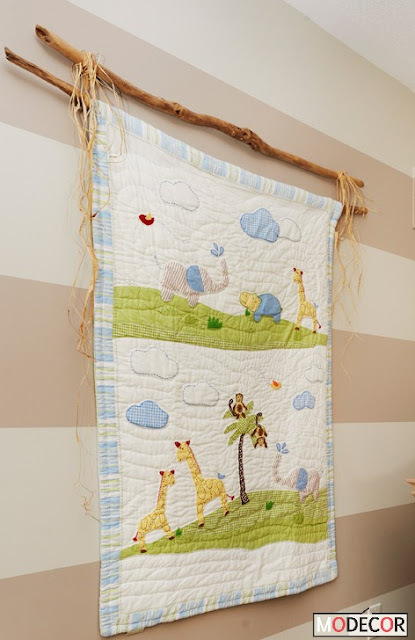 More colour inspiration came from Pottery Barn Kids 'Jungle Friends' Baby Nursery collection . Fell in love with this colour palette and knew it could work for a baby boy or baby girl. The quilt is hung from two pieces of driftwood from our cottage.... actually borrowed from my walking stick collection... and tied with raffia. 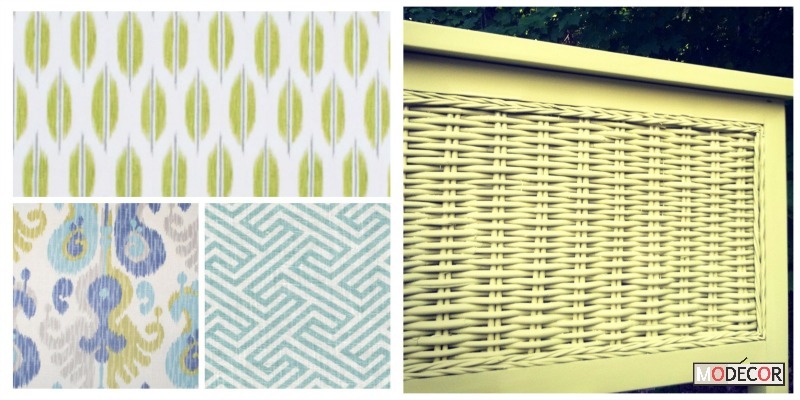 Fabric from Tonic Living was ordered, and paint selected for the former coffee table turned into a toy box. 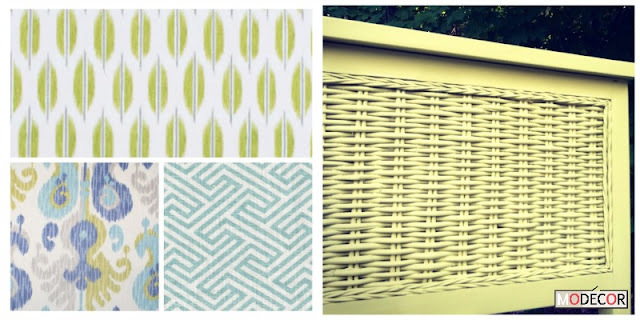 The coordinating leaf pattern, IKAT and geometric evoked a sense of calm, jungle to me, and adding the DIY spray painted toy box completed the colour scheme. Every nursery should have shelves, and in this case we saved a ton of money by hanging white floating shelves from IKEA. All the pillows and toy box cushion seat are MODECOR designs and the items on the shelves and stuffed animals on the toybox are baby shower gifts . More colour, pattern and texture were added to the glider vignette as discussed in the previous post. I really enjoyed making the pouf and have passed on the pattern, with my own adaptation, to other keen pouf knitters. I was thrilled with the custom roman shade I designed and had made by a small local workroom Window Coverings by Wayne Chaif. 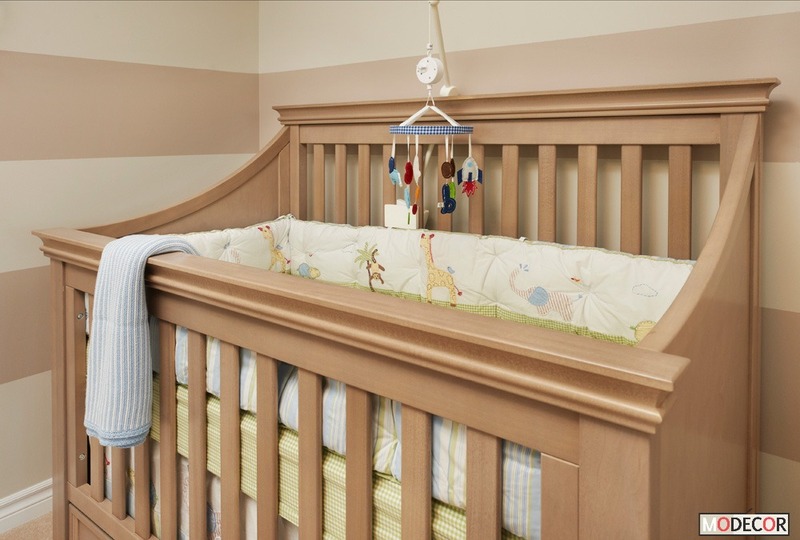 Love how the dresser / change table fits snuggly into the dormer. 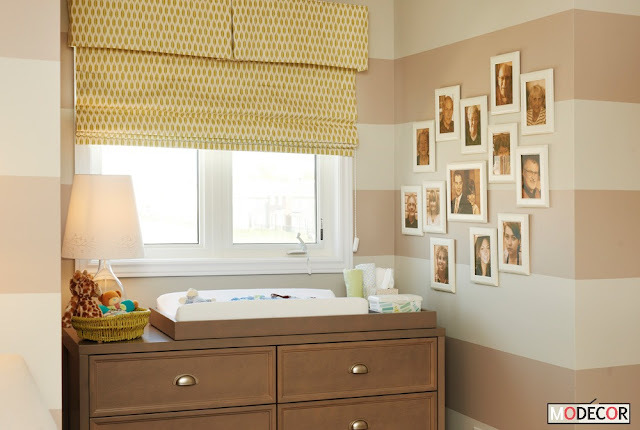 The only nursery project I kept a secret was the family photo wall. I wanted to surprise Mommy and Daddy. It's important that Bean have relationships with his closest relatives...some of whom do not live in Ottawa. I antiqued and framed head shots of Mommy and Daddy, both sets of grandparents, both aunts and one uncle and five great grandparents (you heard me...five great grandparents) and hung them in an irregular pattern, as if from a family tree so that Bean can become acquainted with our faces. 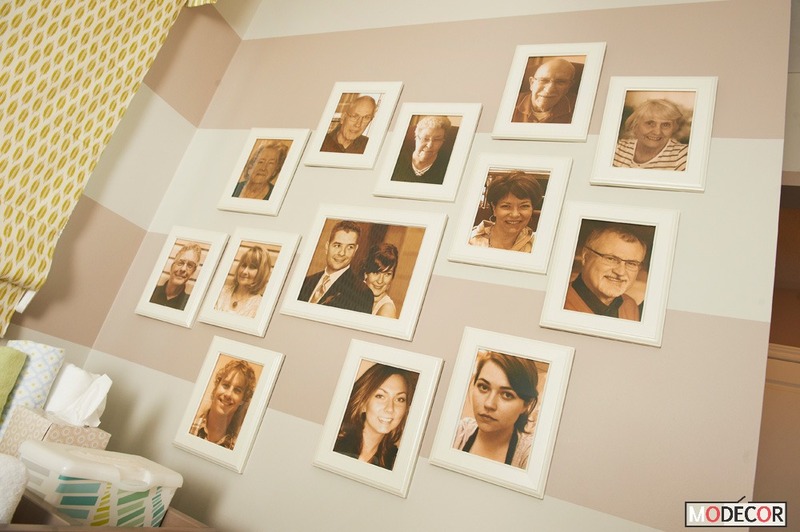 This was a super inexpensive DIY as I adjusted the colour, printed the photos and framed them in IKEA frames. 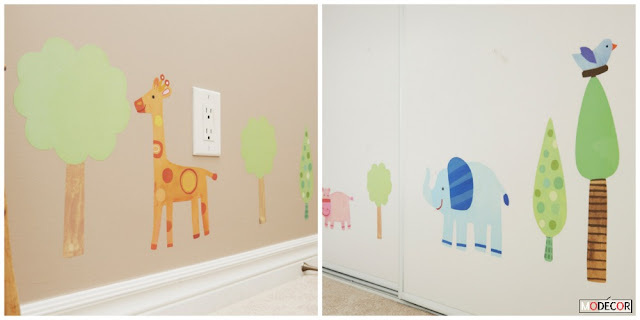 The narrow hallway between the nursery and the adjoining bathroom needed some colour and pattern too. These jungle animals are peel and stick....then peel and stick again. They can be moved up the wall as Bean starts to toddle around. I started to think that raffia had a great jungle vibe and texture, so I made sure it was repeated in various areas around the room. Hanging the quilt, tying up a cushion cover and wrapping the cord on a wall sconce. It's almost perfect. Bean will make it absolutely so. Stay tuned for more of Bean's nursery. Ottawa at Home magazine will explain the expenses of Bean's nursery in a 'high / low' article in the Fall issue coming out in September.